Technology has made our lives more efficient and more convenient. Today, it’s no surprise that exercise technology is re-shaping the way athletes train and exercise. It is now possible to track every aspect of exercise, not just for the elite athlete, but for the lay individual as well. Improvements in design and function have spawned a new breed of sophisticated exercise watches and monitors that are wireless and extremely accurate at tracking various body metrics. If you’re looking for the most versatile and sophisticated heart rate monitor on the market, our recommendation for 2019 is the Fitbit Charge HR Wireless Activity Wristband. It represents the pinnacle of heart rate and exercise technology. The best part is that there a variety of budget devices as well that are widely available online, and you can own one within a day, regardless of where you live. A great example is the Polar FT4 Heart Rate Monitor.In this article, we will simplify the buying process for you with the help of our top heart rate monitor reviews as well as tell you all you need to know about heart rate specific training. A heart rate monitor watch is a device that measures a user’s heart rate in real time (i.e., heart beats per minute). These devices are greatly beneficial to a wide range of athletes as well as people following any exercise routine. A heart rate monitor watch (HRM) acts as an indicator telling you when to speed up or slow down to achieve the results you want from your workout. There are many types of heart rate monitors in the market today with the latest technology including heart rate monitor watches without straps that can track a user’s heart rate from the wrist only. Resting heart rate: The resting heart rate is simply your heart rate at rest. It is easiest to check your resting heart rate in the morning after you’ve had a good night’s sleep, but you can also check it anytime during the day. Make sure you have either heart rate monitor watch and then lie down in a quiet place for about 20 mins. After 20 mins, record the lowest value on the monitor and use this as your resting heart rate. Your heart rate increases directly as you increase your exercise intensity until you reach the point of exhaustion. At this point, your heart rate begins to level off which indicates that you are approaching your maximum heart rate value – this is the highest heart rate value that you achieve in a vigorous effort to the point of total exhaustion. The max heart rate value is an extremely reliable value since it changes only slightly every year – a decrease of about one beat per year beginning between 10-15 years of age. The target heart rate (THR) zone is a percentage value of your maximum heart rate. This range is 50-85% of your maximum heart rate. But, to arrive at your THR, you need first to calculate your max heart rate. HRmax = 220 – your age. The American Heart Association has created the following chart of average max heart rates according to age. This chart is intended to be a general guideline. However, you should keep in mind that each’s max heart rate value may differ greatly. To determine your real max heart rate, visit your physician and ask him to perform a treadmill test. Depending on the goal of your workout you can train at different percentages of your max heart rate. These zones are calculated by taking into account your max heart rate and your resting heart rate. Who should use a heart rate monitor Watch and Why? Even after working out for months and in some cases more than a year, many people don’t achieve the results they’re after. Everyone has different goals; some people want to achieve the elusive ‘5 min’ mile, others want to compete in marathons or cycle cross country or both while others just want to look good with a six pack. Each fitness goal requires a certain training protocol and commitment. The number one reason that most people fall short of achieving their fitness goals is either under training (not getting enough exercise) or over training or inconsistency in training. The greatest advantage of the heart rate monitor watch is that it acts as an indicator showing you the target heart rate zone you need to work in to achieve your desired results from your workout. It tells you exactly when you need to speed up or slow down and is a constant reminder that motivates you to get in the zone and achieve success with every workout. Runners: Imagine that you’re on the treadmill or out running. You’re training for a marathon. You feel like you’re at a good pace, but then you look down into your watch and realize that you’re 20 beats short of the zone. You remember some inspiration your coach gave you, and then you switch gears. The heart rate monitor watch is your coach, you friend and most importantly the motivation that reminds you to train harder. Joggers and walkers: The best heart rate monitor watches are not just for the elite athlete, but for everyone in pursuit of leading a fitter and healthier life. Joggers and walkers can benefit immensely from this powerful gadget. By aiming for aerobic target zones, you can build cardiovascular fitness and strength as well as reduce your exercise time by learning to be more efficient with your breathing and movement. Cyclists: An heart rate watch can be extremely useful for a cyclist. It can track your entire journey whether it is cross country, enduro or downhill and give you relevant feedback on your training performance. Although some bikes come fitted with sensors on the handle-bars, these are rarely accurate, and you’re better off looking for a bike with a cadence sensor or foot pod. Hikers, climbers, and skiers: A heart rate monitor watch is a truly invaluable device for climbers and long distance skiers. It provides all important training feedback that aids in preparation and training as well as on the actual ascent. Swimmers: Swimmers like runners can benefit immensely from a heart rate watch. Whether you are training for endurance or V02 max, you will be in a better position to develop efficiency and build speed. There are several water-resistant watches available online that are fully safe for swimming at depths of up to 50 meters (5ATM water resistant). Weight-loss participants: A heart rate watch can be a great companion if you’re looking to lose weight. These heart rate watches can push you to get in the fat-burning zone and ensure that you get a vigorous workout, so you don’t feel like most good quality heart rate watch comes with a built-in pedometer and tell you the number of calories burned during a workout. Injury-rehabilitation patients: The best Heart rate monitor watches don’t just provide crucial feedback to people recovering from cardiac episodes, they also serve as great tools that help regulate and encourage moderate movement in lay people and athletes recovering from injury. By providing real-time data, these devices ensure that you’re recovery is a safe and steady process. Chest Strap Heart Rate Monitor: The chest strap models come with a chest strap and a wireless wrist heart rate monitor watch that displays the relevant data. The chest strap is equipped with a wireless sensor that detects your pulse electronically and relays that data to the wristwatch that displays it. These models can be paired with a foot pod that attaches to your shoelaces and track your speed, distance, and cadence. Some pods may also have GPS receiver capabilities to track speed, distance and elevation, mark/find locations and save previous course info. Strapless: Strapless heart rate monitors are simply wrist heart rate monitor watches without the chest strap. They obtain their data from the user’s wrist, and they operate entirely as a single unit. They do not require any extra equipment, and they rarely pair with sensors/pods that calculate speed or distance. Many physical therapists, as well as doctors, recommend the chest strap since it is located closer to the heart and has an advantage in providing a more accurate reading. On the other hand, many users prefer the strapless heart rate monitor because it is easier to use as well as more comfortable. Although in our experience, the strapless models have good accuracy, you’re better off with the chest trap, if you’re priority is 100% accuracy. However, it is important to keep in mind that not all heart rate monitor watches are the same. When deciding between the heart rate monitor without chest strap and with the chest strap, it comes down to personal preference. If you’re looking for good accuracy and comfort, you should choose the heart rate monitor without chest strap. On the flipside, if you want accuracy over comfort, you’re probably better off with the chest strap heart rate monitor watch. Finger sensors are easier and more convenient to use than the chest strap models. However, most of them require the user to pause in the middle of their workouts to get an accurate reading. These models are not nearly as accurate as the chest strap kind. The new generation of Foot pods is a small, lightweight device that you simply snap onto your shoe and forget about it. They are eerily accurate, and you never have to worry about them falling off. They work extremely well, whether you’re running indoors or outdoors. Each foot pod is given a unique ID to connect to your watch, so there’s no interference with others. Hassle free. Once the pod is enabled, you typically want to calibrate it for the highest levels of accuracy. In general, we recommend going to track, but you can also use GPS to calibrate it. These nifty little devices give you second by second heart rate data, speed, distance and even running cadence (the number of times your foot strikes the ground per minute). Read our heart rate monitor reviews of the best heart monitor watches on the market and find out about finger sensor and foot pod connection. Apart from providing users with basic heart rate information, many wrist watches today come packed with several useful features. Read our heart rate monitor reviews to learn about the some of the most versatile and best heart rate monitor watches on the market. Tracking heart rate and accuracy: It doesn’t make much sense buying an expensive HRM watch with all the extra features if it can’t give you an accurate reading. A good model wrist-watch should provide an accurate real-time average heart rate, along with the high, low and target heart rate achieved during your workout. 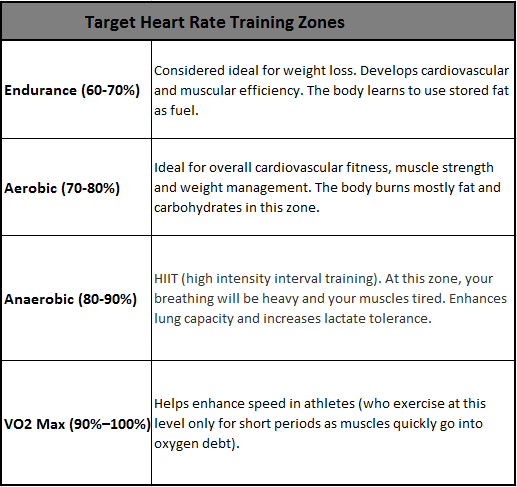 Target Heart Rate Zones: A good level model will offer a couple of target zones and will have the capacity for several target zones. If you’re looking to train in various target zones (e.g., endurance, aerobic and anaerobic variations), you should look for a heart rate watch that can be programmed to accommodate your various workout goals. Time in target zone: The amount of time you will spend in any target zone will be a function of your workout and your training goals. Having this data on hand can serve as a crucial vantage point from which to analyze your training so that you can make further progress. Recovery Heart Rate Tracking: This metric tracks the time your heart takes to return to it resting rate. It indicates cardiovascular fitness and is valuable data, especially if you’re workout includes any interval training. Fitness tests and Pre-programmed workouts: The best heart rate monitor watches provide Industry standard fitness tests users can take part in to gauge their performance to discover their peak output. Some even include pre-programmed workouts for users to follow that include several activities to push you to maximize your performance. Calorie counter: Tells the number of calories burned during your exercise. Speed and distance Tracker: Calculates the speed and distance covered in a workout. This is typically done via a GPS receiver. However, you can also use a foot pod. Stopwatch: Time your workouts and engage in interval training. Use the lap button to “split” your routine and track changes in your pace. Digital Interface: Connects your heart rate monitor watch to your laptop or smartphone either wirelessly or through a separate online connection. You can download your training stats for analysis and even share them with friends. If you’re planning on buying accessories such as a foot pod or finger sensor for you watch, it is always to stick with a consolidated system. (e.g.,. Garmin etc.). Tethering: This is a cool setup that some heart rate watches allow for. The tethering capability essentially gives you control over your smartphone or another device, so you can dig into messages, browse social media and even play music without ever taking your phone out. User-friendliness: Comfort and ease of use are equally important. You don’t want to spend hours trying to figure out how to use the monitor and then have it poke into your wrist or fall of ever so often. Check out our heart rate monitor reviews and choose a the best heart rate monitor watch for your wrist. We cover the best heart rate monitors with the highest ratings. Coded transmitter: This function encrypts transmissions from the chest strap sensor to your specific wristwatch to prevent a jumbling of the signal, from various other units in the vicinity. Bicycle-mounting options: A bike mount for the monitor that make a display, easier can be a great convenience if you’re a cyclist or enjoy cycling as a regular exercise. 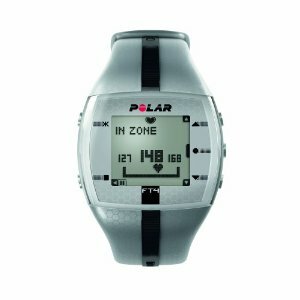 The polar heart rate monitor ft4 is designed specifically for women and is one of the best heart rate monitors on the market. It comes in some very stylish colors and is light and comfortable on the wrist. This particular polar heart rate monitor ft4 comes with a heart rate chest strap made of soft fabric that makes it easy on the skin, so you can wear it for longer workouts and especially on long runs. Along with greater comfort, the strap also provides greater accuracy in heart rate display. Although the design makes this watch a little bulky to look at, it includes some pretty neat features. The polar heart rate monitor ft4 counts calories and provides a continuous and accurate heart rate reading, unlike most products that require you to pause to register a reading. It is also water resistant up to 30m and has a long lasting battery life (12 months with 30m per day). The heart rate sensor can be programmed for different training zones, and it has an indicator for when you’re in the zone. Readings are displayed as either beat per minute or as a percentage of your HRmax. The polar heart monitor is a rock solid heart rate monitor that is compatible with some Polar products and gym equipment. It has Bluetooth connectivity with a large range of devices and apps. The H7 works with iPhone 4S, the iPod Touch (5th generation), iPad (3rd & 4th generation), iPad mini, iPod Nano (7th generation), and with select Android devices using Android 4.3 or later. This technologically gifted polar heart monitor provides a real-time accurate heart rate reading on land and in water. Like the previous FT4, this one also comes with a chest strap that is comfortable and user-friendly. The Polar ft7 heart rate monitor is a few step ups from its younger sister the FT4 polar heart monitor and is definitely up there with the best heart rate monitors. This isn’t just another heart rate watch for women; it is more a sophisticated gadget for the fitness enthusiast and elite athlete. The polar ft7 heart rate monitor gives you a training summary after every workout (tracks up to 99 workouts) which displays your average heart rate, max heart rate, high’s and low’s, and the number of calories burned. Like its younger sister, it comes with a comfortable H1 heart rate chest strap that provides an accurate and continuous reading. 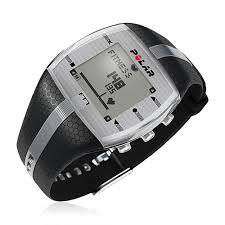 This polar ft7 heart rate monitor uses your age to determine your max heart rate and target rates. It has an indicator and alarm that goes off every time you work out in the zone, so you know when to push and how hard to push. It also shows you whether you’re burning fat or improving fitness, and it operates well in water. The Polar ft7 heart rate monitor has a unique code and encrypted transmission to safeguard against cross-talk when you’re in the gym. While it does not come with Bluetooth connectivity, it offers five different target training zones based on you heart rate max so that you can train for five different goals. 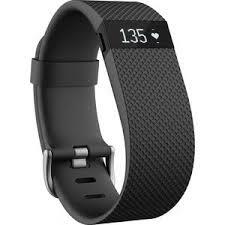 It is no secret that fitbit heart rate monitors are a force to be reckoned with in the Fitness industry. They have a keen vision for sports and fitness technology and the expertise to make that vision a reality. With Fitbit, each product is a statement and a way of life. The Fitbit Charge HR demonstrates their keen sensibilities for style, sophistication as well as function. The Charge HR series of wireless activity wristbands track a multiplicity of metrics from, the number of steps taken, to floors climbed, to sleep quality, to calories burned and much more. These fitbit heart rate monitors fit extremely comfortably on the wrist, and one can hardly even notice them when one is sleeping. The nifty display, shows time of day, heart rate, steps, calories, caller ID and other daily stats. The band displays a continuous and accurate heart rate directly from the wrist without the uncomfortable chest strap. Users have access to a variety of target heart rate training zones and can Sync stats wirelessly and automatically to their computer and 150+ leading smartphones—including Android, iOS, and Windows. The band also tethers with various smartphones so users can see call notifications directly on the display when their phone is nearby.